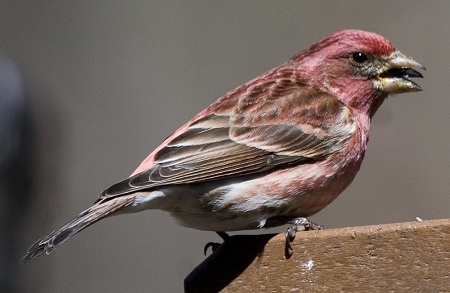 A male Purple Finch pauses in mid-crunch to ask himself, "How do you pronounce Haemorhous, anyway?" From Oak Harbor, Ohio, Kenn writes: Every year now, birders in North America eagerly await the annual publication of the American Ornithologists' Union's Committee on Classification and Nomenclature - better known as the AOU Check-list Committee. This is the committee of experts that makes the decisions about how our birds are classified, what is a full species and what is merely a subspecies, and what their official names should be. Birders usually love it when a species is "split" (it could make our lists larger!) and hate it when two species are "lumped" (which could have the opposite effect). And although the committee is not secretive about their deliberations, we never know for sure how things are going to turn out until the annual supplement in published, in the July issue of the AOU's journal, The Auk. The supplement for 2012 has just appeared, and the changes this time are fairly conservative. There's one split that increases the number of species recorded in North America north of the Mexican border, and no lumps this time. The most notable changes are in the scientific names of several birds. Those of us who enjoy memorizing these Latin names now will have to relearn several of them. First, the "split." The little Pacific seabird called Xantus's Murrelet has been ripe for a split for quite some time: birders recognized that it had two populations with distinctly different face patterns. Now those two will be regarded as separate species. The one that breeds on islands off the coast of southern California and northwestern Baja, with a mostly dark face pattern, will now be called Scripps's Murrelet (Synthliboramphus scrippsi). The one that breeds mainly on islands off of western Baja (and wanders north into California waters), with more white around the eye, will be called Guadalupe Murrelet (Synthliboramphus hypoleucus). This split is well supported: both of these birds nest on San Benito Island off Baja without interbreeding, and they differ in face pattern, voice, and genetics. The bad thing about the split, of course, is the loss of the name "Xantus's." That could be a problem when we're playing word games with birds! The other changes this time focus on changes in scientific names. As ornithologists continue to learn more about relationships among birds, various birds are being moved from one genus to another. Here's a brief rundown of just those name changes involving birds found north of the Mexican border. Buteo nitidus becomes Buteo plagiatus. Porphyrio martinica becomes Porphyrio martinicus. Caprimulgus carolinensis becomes Antrostomus carolinensis. Caprimulgus vociferus becomes Antrostomus vociferus. Caprimulgus arizonae becomes Antrostomus arizonae. Stellula calliope becomes Selasphorus calliope. Amphispiza belli becomes Artemisiospiza belli. Carpodacus purpureus becomes Haemorhous purpureus. Carpodacus cassinii becomes Haemorhous cassinii. Carpodacus mexicanus becomes Haemorhous mexicanus. One final note: as Roger Troutman pointed out to me in an email, what could be considered the most significant change in the supplement is a change in the sequence. Two major groups of birds - falcons and parrots - are being uprooted from their current position in the checklist, and moved to a completely different spot. Falcons have been placed right after the typical hawks in the checklist sequence, and just before the cranes. Parrots have been placed a little later in the list, after the doves but before the cuckoos, and still well before the owls, hummingbirds, swifts, and woodpeckers, all of which come before the huge group of songbirds. Well - that's about to change. Falcons and parrots are going to be placed after the woodpeckers, and just before the songbirds. Say what? Falcons not considered relatives of hawks? Parrots considered to be practically songbirds? This is going to call for a major shift in our thinking! It also calls into question the practice of some field guides in slavishly following the official checklist order, rather than placing similar birds close together in the book. I think I'll write something about that in a separate post. Yes Kenn, how do you pronounce Haemorhous? Thanks Kenn for summarizing it for us! I was overwhelmed when I was looking at it earlier. Kenn, since reading this I've been wondering about the vocal similarities between falcons and hawks. It's not that surprising if the physical similarities are due to convergent evolution, but quite a bit more interesting if the vocal similarities have to rely on that explanation. Any thoughts? It also calls into question the practice of some field guides in slavishly following the official checklist order, rather than placing similar birds close together in the book. Amen! Add checklists to that to go with field guides. Besides state lists, how many parks, nature centers, preserves and WMAs print checklists ever few years, maybe even once a decade?